Leonardo, arguably the most outstanding, talented, and inspiring man of the second millennium. But enough about Leonardo Dicaprio, this blog post is about Leonardo da Vinci. Leonardo was born April 15th, 1452 out of wedlock. Fun fact, da Vinci is not Leonardo’s last name, rather, the name is a descriptor simply meaning “from Vinci”. He is most notably known for his paintings, such as “The Last Supper” and the “Mona Lisa”. However, Leonardo was a man of many trades and could also be described as a sculptor, architect, inventor, and a military engineer. He was a man of art and science, but as Walter Isaacson (Author of “Leonardo da Vinci”) has noted, Leonardo would not have been a man to distinguish between the two. Leonardo unified the increasingly dichotomous entities of science and art into a holy matrimony of complete understanding and truth. 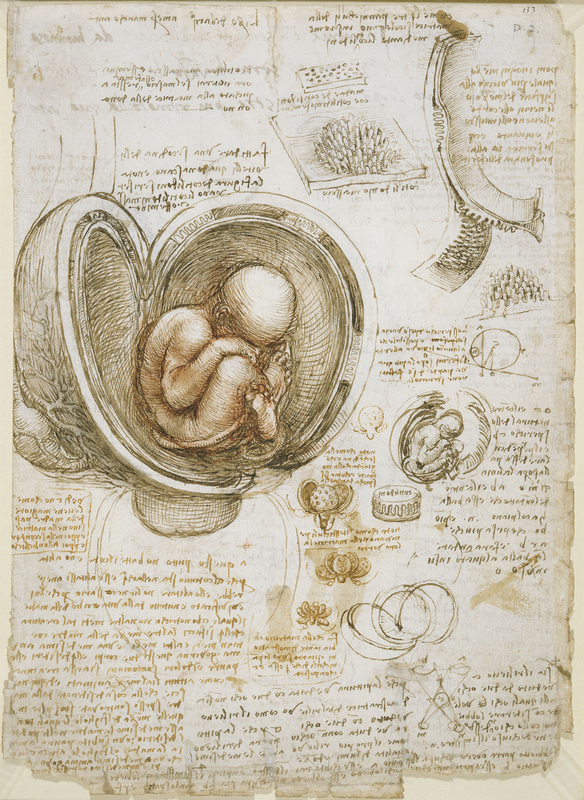 It is this unity of art and science that allowed Leonardo to sketch the anatomy of the human form in such detail. In Dr. Payne’s “History of Medicine” lecture we discussed the early innovators of medical understanding and I must say I was slightly disappointed by the absence of Leonardo from that lecture. During the late 1480s, Leonardo began dissecting human and animal bodies to better understand the anatomy of life. Some of these sketches such as fetus in utero, and the heart and vascular system are the first on human record. 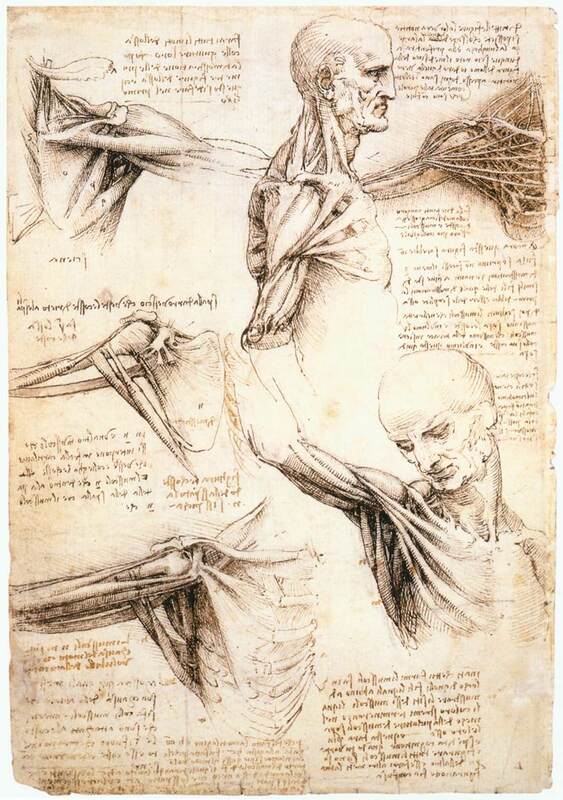 His commitment to understanding the human body was clear on April 2nd, 1489, when he began his “Book entitled On the Human Figure.” Leonardo completed is first anatomy notebook known now as “Anatomical Manuscript B”. However, this book was mostly unused and empty as he had only access to one corpse at the time of the construction of the notebook. It was not until the year 1510 when Leonardo was able to partner with a young anatomy professor Marcantonio Della Torre, that he had access to cadavers necessary for his work. 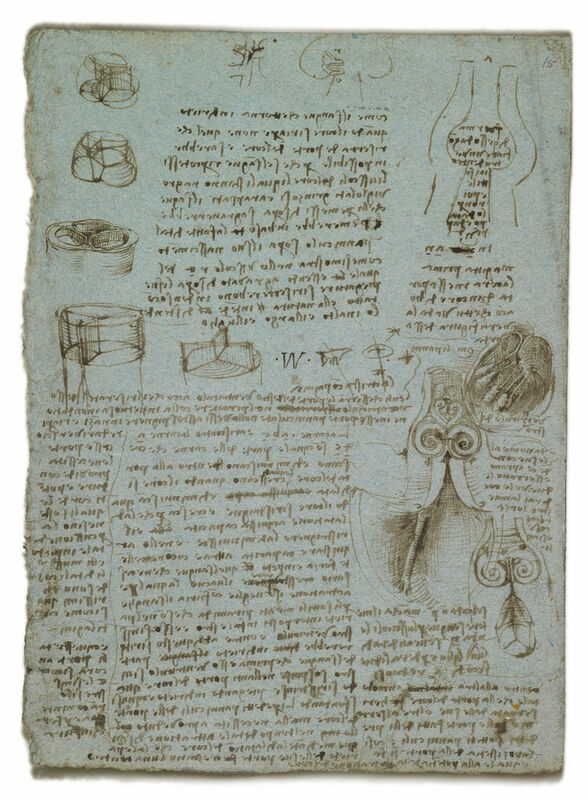 It was with this access Leonardo completed what is now known as “Anatomical Manuscript A” which consisted of 240 individual drawings over 13,000 words of notes. Leonardo made tremendous discoveries. He was the first to accurately depict the human spine. His notes described detailed documentation of liver cirrhosis. At the time the heart was believed to be a two-chamber system but Leonardo was the first to state in his notes that the heart was a four-chambered system. Not only this, he also correctly determined the pumping nature of the heart stating that two atria or “filling chambers” contract together while two ventricles or “pumping chambers” are relaxing. Leonardo noticed how spears that have been plunged into the hearts of pigs moved as the heart pumped, and using this information with his sketches he correctly determined the twisting nature of heart contractions. However, all these findings are overshadowed by Leonardo’s complex and integrated understanding of the hydrodynamic properties of the aortic valve. In 1968 two engineers B. J. Bellhouse and F. H. Bellhouse of Oxford University published a paper in nature discussing fluid dynamics of the aortic valve. The elementary way to describe valve function is that under the pressure of flowing blood the valves open and once the pressure is gone the backflow of blood closes the valve. However, it is a tad more complex than that. If those were the true dynamics of the heart the left ventricle would have a significant amount of blood back flowing into it before the valves could shut. Rather, little to no backflow is observed. This paper titled “Mechanism of Closure of the Aortic Valve” explored the true fluid dynamics of the aortic valve suggesting that the valve creates a turbulent flow of blood that results in quick and more efficient valve closure. This paper only had one citation and it was Leonardo Da Vinci (Note: The cite is actually K. D. Keele 1952 “Leonardo da Vinci on Movement of the Heart and Blood” which is simply a review of Leonardo’s circulatory work. However, the concept still stands, all the original work in this book was Leonardo’s). Leonardo made this realization approximately 450 years before these engineers by building a glass model of an ox heart’s sinus of Valsalva and pumping water with grass seeds through it to observe the flow. In this beautifully elegant experiment, Leonardo observed these vortexes and correctly hypothesized there importance. Now if you’re anything like me, you’re wondering why Dr. Payne mentioned nothing about Leonardo da Vinci in our history of medicine lecture. Leonardo had completed a majority of his anatomical work by 1513 and Andreas Vesalius the anatomy artist discussed in class was born in 1514 (It has even been suggested that Andreas Vesalius had access to some of Leonardo’s early anatomical work). The answer to this question is simple. Leonardo did not publish any of his work. He only kept unorganized notes of the many experiments he performed. To me, this is what made Leonardo special. He did not research for recognition, fame, or praise. He asked a question simply because he had an insatiable curiosity for the discovering the world. Leonardo maintained what I would describe as a “Child’s mind” far into his adult years. He chose to ask “Why” and never made learning a chore, but rather kept it as the adventure it was meant to be. He is, to me, the truest symbol of innovation and wonder that has existed in the brief history of this earth. I think we can learn from Leonardo and hopefully, you feel inspired to explore your world and never stop asking “Why”. If you have not gotten your Leonardo da Vinci itch out yet, here is a long documentary about his history in anatomy. This work by Dylan Fossl is licensed under a Creative Commons CC-BY Attribution 4.0 International License.